Produce delightful, harmonic melodies in natural outdoor settings with the one-of-a-kind Duet. The innovative design of the Duet combines tones of a marimba and xylophone together in a single symphonious 18 note instrument. 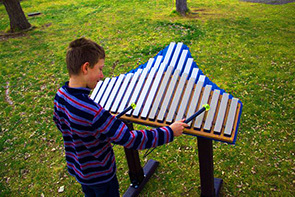 9 aluminum and 9 fiberglass keys and individual resonators are fixed on HDPE housing—allowing players to create bold, earthy and bright resonating musical sounds. 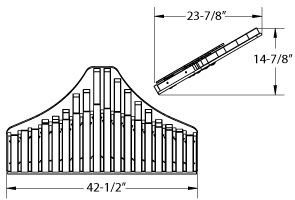 The heavy-duty, all-season instrument encourages inclusive, individual or group play and never produces incorrect notes. Duet accommodates popular installation methods and comes standard with 2 attached plastic-tipped mallets.